Let $R$ be a $\ast$-prime ring with characteristic not 2, $U$ be a nonzero $\ast$-$(\sigma,\tau)$-Lie ideal of $R$ and $d$ be a nonzero derivation of $R$. Suppose $\sigma$, $\tau$ be two automorphisms of $R$ such that $\sigma d=d\sigma$, $\tau d=d\tau$ and $\ast$ commutes with $\sigma,\tau,d$. In the present paper it is shown that if $d^2(U)=(0)$, then $U\subset Z$. Aydın, N. and Soytürk, M., $(\sigma,\tau)$- Lie ideals in prime rings with derivation, Doğa- Tr. J. Of Math., 19, 239-244, 1995. Bergen, J., Herstein, I.N. and Kerr, J.W., Lie ideals and derivations of prime rings, J. Algebra, 71, 259-267, 1981. Kaya, K., $(\sigma,\tau)$- Lie ideals in prime rings, An. Üniv. Timisoara, Stiinte Mat., 30 (2-3), 251-255, 1992. Lee, P. H. and Lee, T. K., Lie ideals of prime rings with derivations, Bull. Inst. Math., Acad. Sin., 11, 7580, 1983. Oukhtite, L. and Salhi, S., On commutativity of $\sigma$-prime rings, Glasnik Math., 41, no. 61, 57-64, 2006. Oukhtite, L. and Salhi, S., $\sigma$-prime rings with a special kind of automorphism, Int. J. Contemp. Math. Sci. Vol. 2, no.3, 127-133, 2007. Oukhtite, L. and Salhi, S., Lie ideals and derivations of $\sigma$-prime rings, Int. J. Algebra, Vol.1, no. 1, 25-30, 2007. Oukhtite, L. and Salhi, S., Centralizing automorphisms and Jordan left derivations on $\ast$-prime rings, Adv. Algebra Vol. 1, no. 1, 19-26, 2008. Posner, E. C., Derivations in prime rings, Proc. Amer. Soc., 8, 1093-1100, 1957. Türkmen, S. and Aydın, N., Generalized $\ast$-Lie Ideal of $\ast$-Prime Ring, Turkish J. Math. 41 (4), 841-853, 2017. Institution: CUMHURIYET UNIVERSITY, FACULTY OF SCIENCE, DEPARTMENT OF MATHEMATICS, MATHEMATICS PR. ISNAD Aydın, Neşet , Koç, Emine , Gölbaşı, Öznur . "On $\ast$-$(\sigma,\tau)$-Lie ideals of $\ast$-prime rings with derivation". 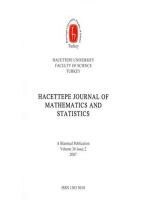 Hacettepe Journal of Mathematics and Statistics 47 / 5 (October 2018): 1240-1247.